If you’ve longed to make your own beauty products but don’t care for the hassle of hunting down pages of ingredients, Herban Crafts will do the legwork for you. The Washington, D.C.-based company plans to launch its inaugural range of DIY kits in June, but it still requires additional seed money to kick production into gear. Currently raising money through IndieGoGo, Herban Crafts is clear about its mission. Besides eschewing chemical-laden dyes, fragrances, and preservatives in favor of organic and fair-trade botanicals, the business will also employ undeserved women in the D.C. area, providing jobs training to help them reenter the work force at a later date. Herban Crafts has six different kits in the works: a body scrub, fizzing bath salts, a mint cocoa lip balm, a bath tea facial steam, herbal soap, and a citrus spice cologne. Herban Crafts’ ingredients have been chosen to minimize allergic reactions. 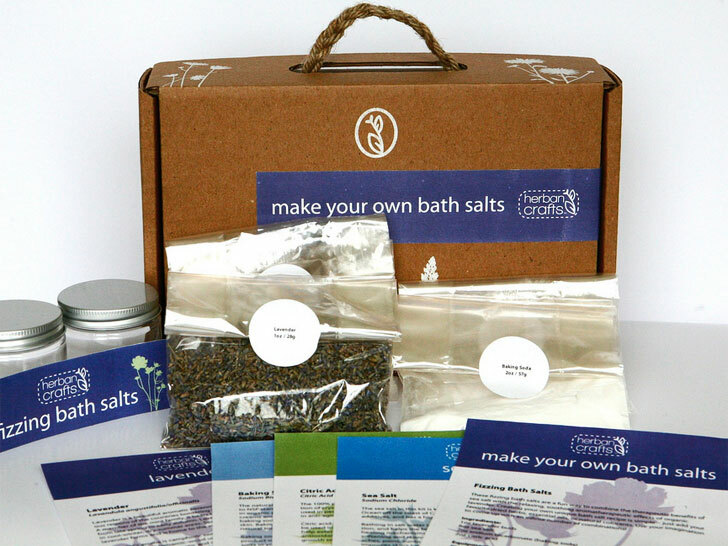 Packaged in a recycled—and recyclable—cardboard tote, with minimal plastic packaging, each kit includes everything you need to make two products, including ingredients, recipes, and information about the featured herbs. Herban Crafts’ ingredients have been chosen to minimize allergic reactions. Plus, all essential oils are safe for children and pregnant women, making them perfect for sharing with a friend, crafting with kids, or giving as gifts. The kits will retail at $34.95 each, but you can get in at ground level by contributing as little as $5 through IndieGoGo. Donating additional sums unlocks a series of goodies, including your choice of one or more kits. All proceeds will go towards purchasing ingredients and packaging, printing, marketing, and hands-on training. i need this products in my city: Recife/Brasil. If you've longed to make your own beauty products but don't care for the hassle of hunting down pages of ingredients, Herban Crafts will do the legwork for you. The Washington, D.C.-based company plans to launch its inaugural range of DIY kits in June, but it still requires additional seed money to kick production into gear. Currently raising money through IndieGoGo, Herban Crafts is clear about its mission. Besides eschewing chemical-laden dyes, fragrances, and preservatives in favor of organic and fair-trade botanicals, the business will also employ undeserved women in the D.C. area, providing jobs training to help them reenter the work force at a later date.